Green Bay Packers head coach Mike McCarthy (right) talks with injured quarterback Aaron Rodgers on the sidelines during the game against the Dallas Cowboys at AT&T Stadium. "We’ll have a plan for him come Wednesday," McCarthy said. "We’re game planning right now for Matt Flynn," McCarthy said. "That’s where we started our conversation Saturday. We do some preliminary game planning each week for the next opponent. That’s the way we’re going about it as an offensive staff." Last week, when the Packers ruled Rodgers out against Dallas, McCarthy said that it was "in our best interest as a football team, as an organization, for Aaron not to play in this game." 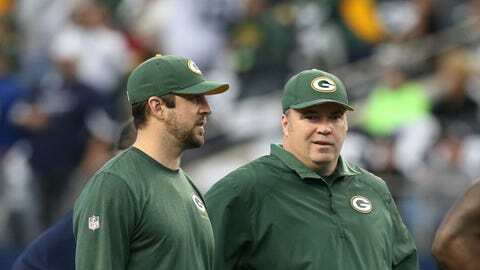 McCarthy also added, "this is clearly a decision that’s made in the best interest of Aaron Rodgers."